As the final installment of my investigations into artist's canvas, this time I'm looking at canvas keys, gallery wrapped canvas vs traditional profile canvas and the idea of unstretched canvas. Previous related posts cover all about painting substrates, all about the types of artists canvas and stretching your own canvas. Some stretched canvasses come with little wooden wedges. What are these for? They are known as canvas keys. They should fit into slots in the inner corners of the canvas stretcher. They are a traditional method for tightening up a canvas that has begun to sag. Unfortunately, they are not a very good method for doing this. Any canvas that has developed a sag should be carefully taken off it's stretcher and re-stretched. Using canvas keys to take the sag out of a painting risks damaging the painting. It is possible to accidentally hammer the back of the painting if the keys are missed, breaking the paint. Using keys puts a great deal of stress on the corners of a painting which can eventually tear the canvas. The keys will invariably change the shape of the stretcher and it will no longer be square and the painting may no longer fit into it's frame, if it had one. Skip the dodgy canvas keys. Traditional, but not very smart. Take the canvas off the stretcher altogether and re-stretch it! A canvas stretcher or strainer is under quite a bit of tension once a canvas has been secured onto it. They are usually made from timber and so are prone to warping under tension and changing atmospheric conditions. It is recommended that they include a cross-bar every 60 cm (or 2 feet) or so in each direction to help prevent any warping. A traditional stretched canvas requires framing. The tacks or staples show on the sides of the finished piece. Traditional canvases also tend to have a shallow profile. They are usually only about half an inch thick from the back of the canvas to the front. This is a very modern style of stretching canvas. The canvas is wrapped around two edges of the stretcher bars and secured at the back where the staples or tacks can't show. Often the sides are painted. No visible staples or nails means a neat finish is achieved and no framing is required. Usually this style has quite a deep profile, more than an inch thick from the back of the canvas to the front, though they can also be shallow. The deep profile is the current trend. Artists love gallery wrapped canvas as their artworks are ready to hang as soon as the varnish is dry. Many art collectors prefer it too as it allows them to skip the often substantial costs of framing. Anecdotally, gallery wrapped canvasses nearly put many framers out of business when it first came out as so many people suddenly didn't require their services. Though if you prefer your art in a frame, as some do, gallery wrapped canvas can be framed if you want. It was a revelation to me when I was introduced to the idea of working on unstretched canvas. I was at the exhibition opening of a local artist who had oil pastel paintings on massive canvasses about 1 x 2 m. They were unstretched and looked wonderful. Depending on your point of view, unstretched canvas is either fabulous or awful to paint on. It has a very different working feel to the drum-like bounce of a stretched canvas. To me it's wonderful and predictable. The give in the surface of a stretched canvas is something I find disconcerting. Different artists, different preferences. I guess it's like working on fabric textured board or paper. For the artist there are some significant advantages to working on canvas unstretched. There are time savings as no pre-stretching is required. There are financial savings as no stretchers need to be bought. 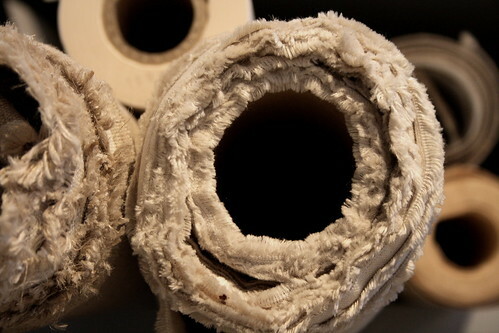 There are space savings as unused canvas can be stored rolled and once painted, can be stacked flat. Believe me, plain canvas takes up a LOT less room than a stack of stretched canvasses. And lastly, unstretched canvas is cheaper to post for a buyer as it weighs less. For the art collector, unstretched canvas can be presented in a number of already familiar ways. It can be lightly stretched onto stretchers/strainers and ends up looking just like regular stretched canvas. Or it can be framed just like any paper artwork. For extra rigidity, it can be mounted (glued) to board before framing. All very normal procedures for your framer. The only downside to unstretched canvas that I can see is that someone needs to frame it. I have a question about the unstretched canvas exhibit. How were they hung? I just started painting on unstretched canvas and now prefer painting this way. The intention was to stretch the painting when finished, but I kind of like the way it looks unstretched and unframed. I know people use binder clips, but I'm wondering if there's something more professional. Thanks for any info. Unfortunately that exhibit was hung in a most unprofessional manner. The works were attached to the walls of the gallery with thumbtacks. Ugh. For me it was the concept that canvas does not have to be stretched that was fascinating. So some ideas for unstretched? I personally like my works on unstretched canvas to be framed, rather like a print. It just happens to be an original on canvas. I have also toyed with the idea of pasting the canvas to board. Then there is the way that asian scrolls are mounted. Hope that helps with your lateral thinking. Ooh yes I could see using a dowel/scroll system or pasting onto plywood, hadn't thought of that. I like the framing idea, but this is just too large. Very cool, thank you!